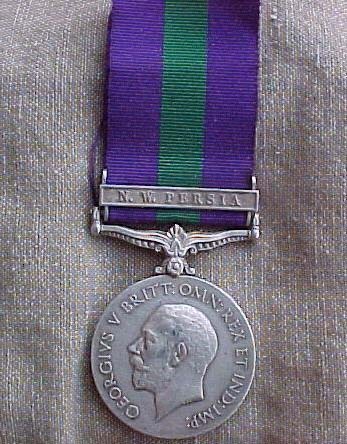 General Sevice Medal with 1 clasp N.W. PERSIA. A beautiful medal to the most Famous unit of the Indian Army under George V Named properly on the edge; "1883 DFDR TEJA SINGH C.OF GUIDES ( CAV )" here is a medal given to a Cavalry NCO of that Corps (that had both infantry and cavalry units). Dafadar is equivalent to a Cavalry Serjeant. Teja Singh was probably a Sikh. He would also have been a veteran of 1914-1918 WW1. The Guides were a part of North Persia Force (Noperforce).